Over Array's 35-year history as a healthcare-exclusive design and consulting firm, we have made it our mission to become confidently familiar with the business drivers of health systems. In fact, our mission statement articulates this rather well: “Array exists to provide remarkable, strategy-driven, business-justified solutions for our Healthcare clients.” Our clients' business objectives must always inform a successful Array project. Understanding these business drivers and the impact of continual regulatory changes is at the core of our practice and informs how we approach developing solutions with our clients. We aspire to continually provide differentiated value by understanding and focusing on our clients' business drivers in every engagement, prompting us to search for unique opportunities others might overlook. The pursuit of solutions to help our clients drive the business of healthcare prompted Array to explore the widening gap between three critical functional areas within health systems: real estate acquisition and development; facilities operations; and, strategic planning. Currently, health systems approach critical real estate strategy decisions in a relatively siloed manner. Strategic planners focus on assessing service line, market and growth opportunities while facilities departments focus on portfolio and asset management strategies. Our solution to this siloed approached, called Pivotal, will allow strategic decisions (what to put where, who will be served there and what services to offer) to be informed by empirical data from both public and proprietary sources, as well as enterprise operating experience. Pivotal, a SaaS technology product, will allow for dynamic, real-time, multivariate analysis of real estate strategies and opportunities. Through the aggregation of market, strategic and asset-based data, Pivotal will enable users to scenario-test strategic decisions to project ROI to optimize approaches. 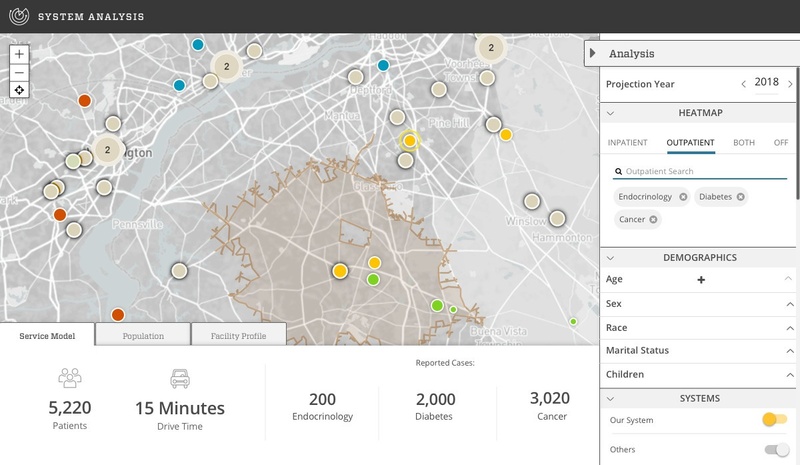 The way in which Pivotal enables healthcare organizations to consume data—filtering, scenario testing and visualization, both geospatially and in proforma spreadsheets—will enhance that data’s value. Additionally, it aids in validating business assumptions as strategic plans unfold. This will considerably shorten the time gap between developing strategic plans and implementing capital programs that result from those plans, thus allowing healthcare systems to react more efficiently to changing enterprise and market conditions. Select health systems are testing Pivotal, which is currently at the minimum viable product stage. While Array does have a deep understanding of the problems our clients are coping with as it relates to the lack of an integrated work flow between real estate and other functional groups within healthcare organizations, we still strive for continual feedback to inform our Pivotal feature and function roadmap development. To ensure we address our clients' most pressing needs, and that those solutions create as much ROI as possible, Array has launched a program to solicit direct, actionable feedback from potential Pivotal customers. Our Lighthouse Program provides a unique opportunity for clients to shape the future of strategic and facilities planning at healthcare systems. By having access to the Pivotal product, using it throughout the organization as they see fit, having direct access to Arrays training and support, and having direct input on the future solution road map, customers experience the solution while benefiting their organization. The Lighthouse Program allows our development team to focus on solutions which convey the most value to our healthcare clients. Working with forward-thinking institutions, who are the driving force behind redefining healthcare delivery, and interacting organically with their teams and workflows will ensure that Pivotal aligns with their needs and expectations. Recognizing that user experience drives acceptance and utilization, the Lighthouse Program will continuous product testing and improvement. By deploying the Pivotal product, receiving concrete, actionable feedback and having customers participate in metrics development to help characterize customer value of the future enterprise solution, Array hopes to continue our nearly four decades' tradition of delivering differentiating value by listening to our clients, and creating solutions addressing their business problems.